LAWRENCEVILLE, GA - The Gwinnett Braves announced today their preliminary Promotional Schedule for the 2017 season. The ninth year of G-Braves baseball at Coolray Field is set to feature seven Post-Game Fireworks displays, four Bobblehead Giveaways and numerous other promotions and theme nights. More promotions are expected to be added leading up to Opening Night on Thursday, April 6 vs. Durham. 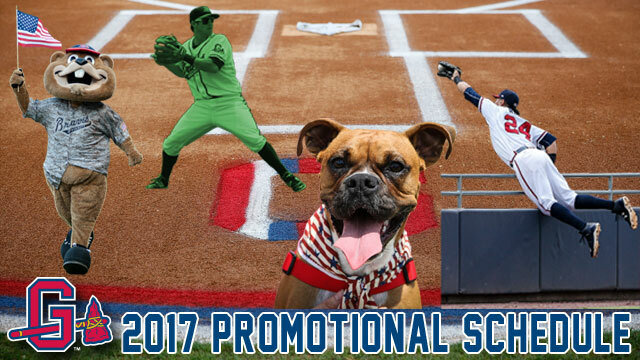 SEE THE FULL 2017 PROMOTIONAL SCHEDULE HERE! The night sky over Coolray Field will light up with Post-Game Fireworks on Thursday, April 6 (Opening Night), Saturday, May 13 (Star Wars Night), Saturday, June 24 (First Responders Night), Tuesday, July 4 (Independence Day), Saturday, July 22, Saturday, August 12 (Chopper's Birthday Celebration) and Saturday, September 2. Sean Kazmar Jr. "Star Wars" Bobblehead, presented by Coolray Heating & Cooling (Star Wars Night, May 13). Rio Ruiz "Super Hero" Bobblehead, presented by Coolray Heating & Cooling (Super Hero Night, presented by REMAX, June 10). Baseball Hall of Famer Phil Niekro Bobblehead, presented by Gwinnett Medical Center (July 22). G-Braves Radio Voice Tony Schiavone and his Chihuahua, Bug, Bobblehead, presented by Coolray Heating & Cooling (National Dog Day, August 26). Dog Day Monday - Each purchase of a Coolray Field berm ticket gets your dog in free. Two-for-Tuesday - All Dugout seats are two for the price of one (excluding Tuesday, July 4). Triple Play Thursday - Fans can purchase four (4) Infield Box tickets, four (4) hot dogs and four (4) sodas for just $40, either online or at the Coolray Field Ticket Office, courtesy of Coolray Heating & Cooling (excluding Thursday, April 6). Sunday Funday - Fans are invited to play catch on the field before the 1:05 p.m. game and kids (ages 12 and under) are welcome to run the bases following the game. Fans can secure their seats to five of the best games of the season with a "Five and Dine" plan, on sale now at the Coolray Field Ticket Office. Each plan includes a Field Box ticket to five different games, a $10 food and beverage credit per seat to enjoy at each game, plus a free G-Braves Hat. There's three plans to choose from, each for just $75: the Combo Plan (three Friday games, two Saturday games), the Friday Plan (five Friday games) and the Saturday Plan (five Saturday games). For more information, visit gwinnettbraves.com/fiveanddine or call 678-277-0340.